I'm off to the farmer's market in a little while and after that, to visit the Pittock Mansion with my family and hike one of the trails nearby. The Pittock Mansion plays a part in my YA novel coming out next year, so I've been meaning to make another visit before the book is put to bed, so to speak, to ensure there's nothing I want to change. 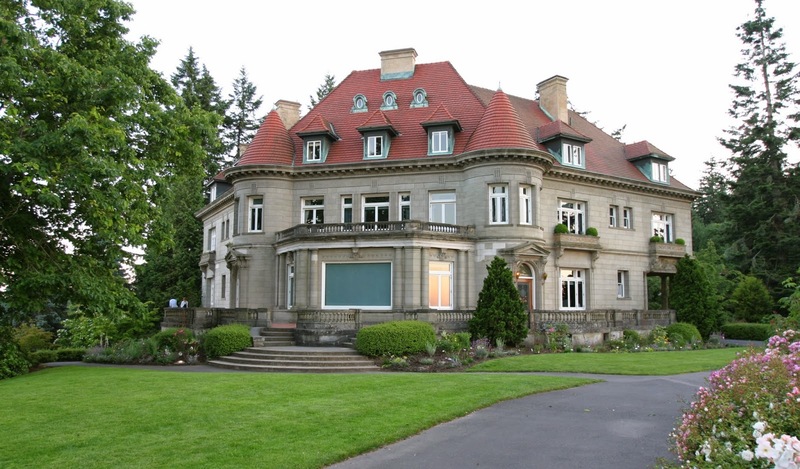 The mansion was built in 1914 and various members of the Pittock family lived in it until the 1950s. They put it on the market and tried to sell it, but they weren't successful. They almost demolished it after the Columbus Day storm in 1962, which caused extensive damage, but the community came together and raised $75,000 to help the City of Portland purchase the property, because it mattered to them. The city bought the mansion in 1964 and went on to refurbished it, and since then, it's a place the entire city can enjoy. The thing about the Pittock mansion is the incredible view. It sits up high in the west hills and it's just a gorgeous piece of property. You can also tour the mansion, which we're also going to do today because my boys haven't been through it since they were little. Here's what I love about the Pittock mansion story. It was almost destroyed. Its owners almost gave up on it, but there were other people who said - this place has value. We WANT it in our community. There are times when I want to give up on a book. Sometimes when I'm drafting it. Sometimes when I'm revising it. And sometimes, even when the book is out in the world and a horrid review or two comes in. It's easy to throw my hands up in the air and say, I give up. But then I'll get a nice e-mail from a librarian telling me how her middle school students are taking turns reading THE BRIDGE FROM ME TO YOU and she can't keep the two copies she has on the shelves. Or someone will tweet me with kind words about one of my books. Or I'll remember that every day, the things that make me the happiest, besides my loved ones, are the things created by other people -- books, music, movies, art. Art matters. Stories matter. I love being a part of that. And, I really do LOVE writing. One of the hardest things we have to do as writers is to separate the business side of writing from the creative side. I have to continue to write stories, somehow, without worrying about whether slow sales of the current book might affect the next book. It's hard some days to do that. To see other authors on twitter who have legions of fans and sell a gazillion copies and to know that will probably never be me. Around release time, when things can be particularly stressful, I try to step away from the computer more. To get outside and spend time doing things that I love, and I try to constantly remind myself that there are many other things worth thinking about/stressing over than one teensy tiny book. For those of you who have bought or read the book, I do want to take a moment to say THANK YOU. Every book that makes it out into the world at some point, could have been demolished. When doubt and fear creeps in, as it so often does, it takes effort to push it away and to keep going. But I do it because there are people who do like my books. Who tell me my work matters. Over the years, I've learned a lot of things, but one of the most important things is this -- there are big successes and there are small successes, but they are successes all the same.